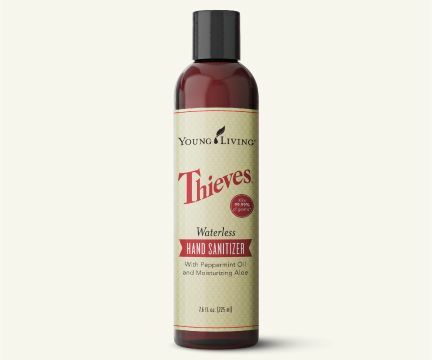 Why is the Young Living Essential Oil blend called Thieves? Century after century, bubonic plague outbreaks decimated the population of Asia and Europe for the better part of a thousand years. Out of this period emerged a legend of four thieves who were captured and charged with robbing the dead and dying victims. When the thieves were tried, the magistrate offered leniency if they would reveal how they resisted contracting the infection as they performed their gruesome acts. They told of a special concoction of aromatic herbs, including garlic, cloves and rosemary, that they rubbed on themselves before committing their crimes. The earliest online English reference found so far is in the 1825 Pharmacologia. After recounting the story of the aromatic vinegar used by the four thieves of Marseilles, it goes on to note that, “It was, however, long used before the plague of Marseilles, for it was the constant custom of Cardinal Wolsey to carry in his hand an orange, deprived of its contents, and filled with a sponge which had been soaked in vinegar impregnated with various spices, in order to preserve himself from infection, when passing through the crowds which his splendour or office attracted. The first plaque raged in 1649, whereas Wolsey died in 1531.” The Pharmacologia then sites the French Codex and The German Dispensatories as possible earlier sources of the vinegar recipes. Today Young Living provides us with a ‘modern’ version of Thieves® It’s so popular that an entire line of useful products was developed. But before we look at everything, let’s first explore the ingredients. Cloves are high in vitamins, minerals and fiber. However, the component responsible for clove’s powerful effects and odor is a substance called eugenol. Eugenol is toxic against harmful organisms, including fungus, and may even relieve discomfort. Clove oil offers a powerful action against gas and bloating. It reduces gas pressure in the stomach, aiding in the proper elimination of food and toxins. It also relieves the discomfort of peptic ulcers and has been shown to be effective against nausea, hiccups, motion sickness and vomiting. Clove oil, which encourages healthy teeth and gums, is a traditional remedy for relieving toothache, sore gums and oral ulcers. Maybe your dentist has given you Clove oil for a ‘dry pocket’ after a tooth removal? Lemon is best known for it’s ability to cleanse toxins from any part of the body and is widely used to stimulate lymph drainage, to rejuvenate energy, purify skin and act as a bug repellant. According to a study published in the International Journal of Food Microbiology last year, lemon oil may actually be the most powerful anti-microbial agent of all the essential oils. Another study published in Experimental Biology and Medicine found that breathing in the scent of lemon essential oils improved neurological activity that promotes the breakdown of body fat. Lemon oil is one of the most “essential” oils to have on hand and can be used as teeth whitener, laundry freshener, cellulite cream, face wash and household cleaner. Jean Valnet MD estimated that it takes 3,000 lemons to produce one kilo of oil. In his book, The Practice of Aromatherapy, Valnet wrote that lemon is a tonic for supporting the nervous and sympathetic nervous system. Lemon and lemon essential oil are also used to decrease cholesterol deposition in the blood vessels and prevent heart disease! The warm, spicy aroma of cinnamon has been sought throughout the ages both as a valuable commodity and for its ability to improve wellness. Cinnamon is thought to promote healthy cardiovascular and immune function, and acts as an antiseptic. You can also use it to enhance your cooking, or dilute and massage into chakras to create a soothing, relaxing sensation. According to the OTAC scale, which is used to measure the concentration of antioxidants in different foods, cinnamon ranks #7 of all foods, spices, and herbs across the world. And in a study that compared the antioxidant activity of 26 spices, cinnamon was deemed the winner and proved to be higher in antioxidants than other powerful herbs and spices including; garlic, thyme, rosemary, and oregano. Cinnamon is used in many cultures to naturally help fight harmful infections and viruses. Cinnamon oils also have protective abilities against various bacteria which can cause negative symptoms in the digestive tract, on the surface of the skin, and can lead to colds or the flu. Did you know there are over 800 different species of eucalyptus, of which at least 500 produce essential oils. Native to Tasmania and Australia where it is a traditional home remedy, the leaves of this tree were historically smoked to improve difficulties in breathing.? Me neither, until I became a Young Living member. With the excellent amount of material and help with learning, I now understand the subtle, but important use of Eucalyptus radiata for Thieves. Another reason that aromatherapists prefer eucalyptus radiata oil(1) is due to its aroma being less ‘searching’ when it’s used to treat sinus and respiratory conditions, especially with young children or the elderly. Interestingly, it is often reported by therapists that they find eucalyptus radiata essential oil more effective in treatments than eucalyptus globulus. Eucalyptus Radiata essential oil is useful for massage after activity, and can be diffused for a stimulating and rejuvenating environment. This oil has a mildly pungent, sweet, and fruity aroma, and includes the naturally occurring constituents 1, 8 cineole and eucalyptol. Eucalyptus Radiata can be used in your favorite household cleaners, and is an important ingredient in Breathe Again™ Roll-On, Thieves®, and R.C.™ essential oil blends, Inner Defense™, and Ortho Ease® Massage Oil. Eucalyptus works as an expectorant and helps cleanse your body of toxins and harmful microorganisms that can make you feel sick. One of the most effective ways to utilize eucalyptus for colds is to drop several drops of the essential oil into your diffuser before going to sleep so you can take advantage of the healing benefits all night long. Eucalyptus EO is an excellent cleanser to remove grease and grime from your workday and can rejuvenate sore hands. Not only does eucalyptus give a nice, fresh fragrance to your home products, but it adds vital anti-microbial properties as well. You can’t go wrong putting several drops into pretty much everything: soap, detergent, laundry soap, mop water, toilet cleaner, window cleaner … the list goes on! Rosemary: Can naturally thicken hair so it is great to add to homemade shampoos. Also, it improves brain function and memory so it’s great to used when working, reading or studying. Rosemary helped people become more alert. Avoid during pregnancy or if you have epilepsy. May cause issues if you have high blood pressure. Always test for skin sensitivity prior to widespread use and use on the feet when possible. Excessive use of any oil can lead to skin sensitization. Keep out of eyes, ears, or nose. Not all oils are created equal, so test brands carefully, and never use an oil in a way not recommended by its maker. The National Digestive Diseases Information Clearinghouse offers a list of the bacterial types, symptoms and sources of many foodborne illnesses as well as preventative measures . Bacteria can live on cutting boards, sponges, countertops, sinks, the grooves between tiles, and many other places in your kitchen. They don’t always come from contaminated, recalled foods. Bacteria grow in moist conditions in your kitchen and can transferred from one surface to another by hands or dishtowels. It’s important to keep your family healthy, but in a fast paced and constantly changing lifestyle it can be hard to constantly monitor what every hand in your house is getting into. That’s why it is important to properly disinfect kitchen surfaces and supplies on a regular basis, in order to keep bacterial colonies from growing in unwanted places. This doesn’t mean that you need to buy a lot of fancy toxic cleaning supplies, or convert all of your soaps to the anti-bacterial variety. In fact, some studies show that using anti-bacterial products do not reduce the occurrence of infectious disease in households any more than using regular cleaning products did . Not only do you not need to rush out and buy expensive cleaning products, but you should use natural or non toxic methods to disinfect your kitchen counters and tile floors. Harsh chemicals have many drawbacks, but natural alternatives do just as thorough of a job at cleaning and at a much lower cost, both to your bank account and the environment. Plus, they usually smell better! Be sure to wash all foods.